People walk by it all the time. Ignore it. Or better yet: they board by. At the very southern edge of campus, on the west side by the train tracks, there exists the more ephemeral of signs. Whenever I walk between from my parents’ house to campus, I pass this sign. When my brothers skateboard or longboard or whatever-the-heck board to my parents’ house, they go by this very sign. Every day, students just north of this sign get on their wheeled little things and zoom around on sidewalks, hopping off when crossing train tracks and then getting right back on again. The board is truly life at Goshen College. And if that is life, then we are all clearly sinners. I also find this sign absolutely hilarious. I have wanted to write something about this sign for ages now and Nathan Pauls, funnies editor, finally got me to do it. It’s clearly such a relic of long ago. In any case, this sign, so wrong and off in the face of today’s campus, is one of my favorite things. So, I have decided to educate you all on what is, perhaps, the greatest sign on campus that no one has ever heard of. I began this work of education by talking to the people who needed to hear it most: the great ones who board. It should be noted that I do not know how to use any sort of board. I have the balance of a drunk man with vertigo. So, I needed to inform those who this would impact before it was too late. “LOL, I didn’t know it existed,” said local bearded board bro Jace Longenecker. Surprisingly, most people are not familiar with the very remote south side of campus that has no buildings and leads only to yet another parking lot and a drainage ditch. 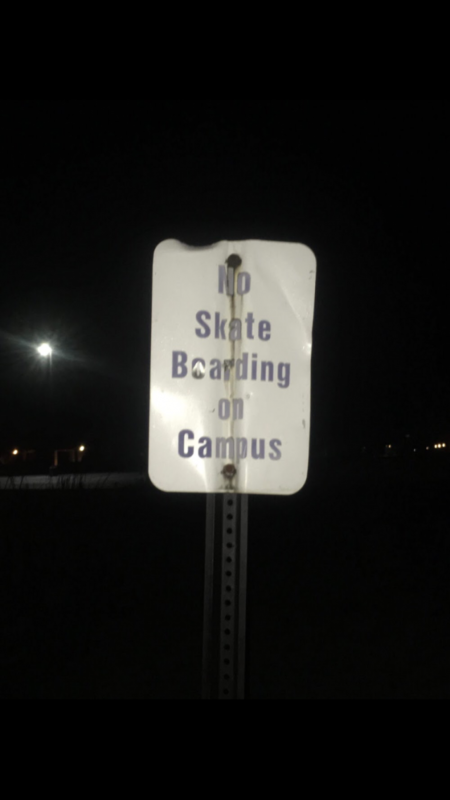 “That sign isn’t valid,” said Kailey Rice, who then proceeded to hop on her longboard and ride away, presumably hoping her board would not be taken from her. Rest easy, Kailey: no one would dare do that to you. “I don’t think that it refers to using them as transportation,” said Hugh Birky, who is obviously doing something with skateboards that we don’t know about. It could be that this man is the reason skateboarding is banned. The answer to this question is to be determined. Truly, this is a sign that nobody actually listens to or cares about. But I encourage all of you to follow the sidewalk to the south end of campus and see this beauty for yourselves. But I implore you, Goshen College: do not take this sign down. Do not take away this symbol of our history and throw it into the dumpster behind Phys Plant. Have it displayed, prominently, so we may all know and remember the law we all ignored and loved to break. Or, you know, we can just leave it. It’s hilarious.